The Market Bosworth Conservation Area encloses Bosworth Hall and its Walled Garden, the Parish Church, the Parish Field and Memorial Garden, part of the Country Park and the historic core of the town reaching to Back Lane, Warwick Lane and along parts of Sutton Lane, Shenton Lane and Barton Road. Please visit the Clerk's Office to view the whole map. The Conservation Area is very important and imposes a number of additional controls within it relating to matters such as property extensions including conservatories, TV and satellite aerials and tree work. For further information on building control within the Conservation Area, contact Hinckley and Bosworth Borough Council's building control team. The Town Trail. Copies are available to purchase from the Parish Council Office and at various outlets around the town centre. Price 50p. 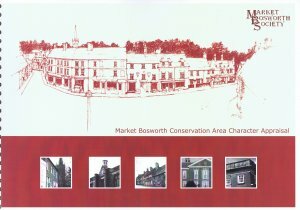 Further information about the Conservation Area is available from The Market Bosworth Society. 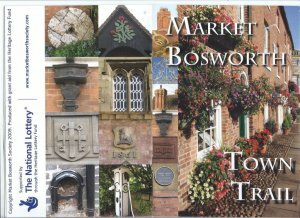 The Society has produced a number of interesting local history publications and was also responsible for the Conservation Area document and the Town Trail.